She arrives early, when the bride is in her final stages of preparation. In the nervous hush, she begins shooting. Amy Theilig’s eyes take in the scene: the wedding dress, hanging by a closet; the bride’s face, tilted upwards as makeup is applied; the bride’s mother, helping her daughter fit the bridal veil; the young woman standing before a mirror, seeing herself as a bride for the first time. Oftentimes, after everyone leaves for the ceremony, only the photographer remains with the bride. Theilig’s camera documents this pensive, anticipatory time, the bride looking out the window, hopeful, happy, and slightly scared. Later, she will be there when the groom first lays his eyes on the woman who is about to become his wife. When the groom stands alone outside the church, fidgeting with his cufflinks, Theilig captures the moment. Bride Nhung Madrid awaits her husband Joe in the hallway of a La Casa del Camino in Laguna Beach in 2008. 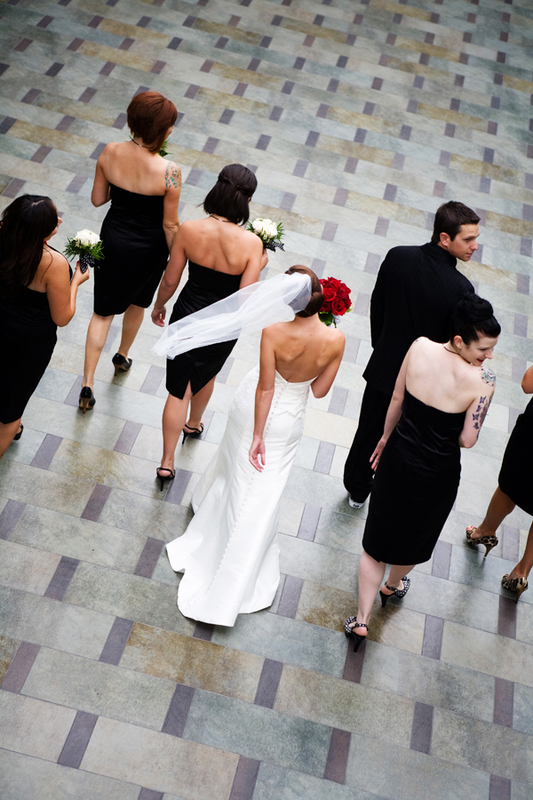 Over the course of a wedding day, Theilig will take anywhere from 600 to 1,000 photographs. She’ll use three cameras and as many as five lenses. Her images include details – the garter belt, the rings, the flower girl’s hands clutching the bouquet – as well as well as the big moments, such as the exchanging of vows or the couple’s first dance as man and wife. The wedding album she will later create is more than a series of photographs. Theilig is a 30-year-old wedding photographer who has shot nearly 300 weddings since launching her own business only four years ago. Her business has taken off with almost no marketing – 90 percent of her clients are referrals. She has quickly become one of the most sought-after wedding photographers in the South Bay because she manages to achieve something rare in wedding photography. She creates art. Bride and groom Rachel and Bruno Salama outside Huntington Beach Library in 2007. Upon graduation, she took a job at a tuxedo shop in Beverly Hills. The shop happened to be across the street from the wedding photographer Kevin Lee, whose shots inspired her. After fitting clients for tuxedos, she would sometimes mention that she was also available for photography. 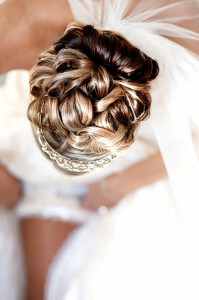 One client took her up on it, and her shots from that wedding found their way to Lee. She had, with very little training or experience, created a series of stunningly beautiful images. Lee hired her immediately as an assistant. 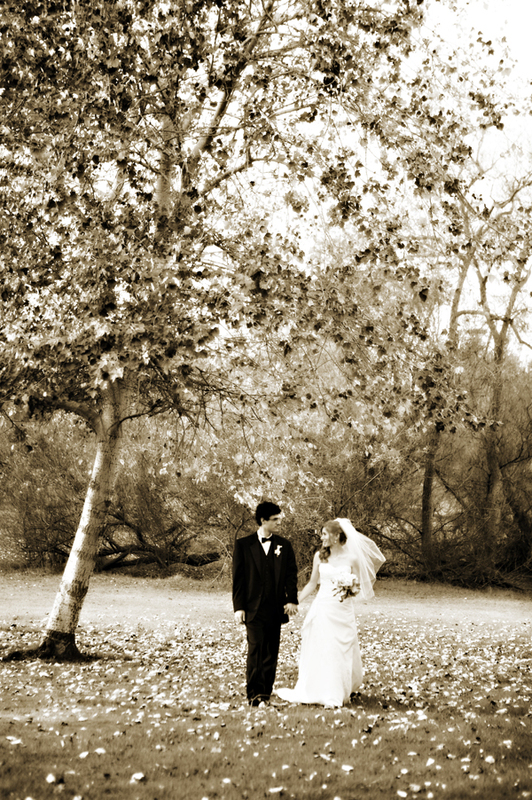 A photo from the very first wedding Theilig photographed, back in 2003, at the Wattles Mansion in Los Angeles. After three years, Theilig returned to her native South Bay and started her own business. Word of her special talent spread quickly. In her first year of business, the photos she took of Shade Hotel owners Mike and Andrea Zislis’ wedding were featured in Los Angeles Weddings magazine. The album from that wedding caught the attention of a Zislis family friend, Sandy Comstock. She saw something extraordinary in Theilig’s work even before her own daughter, Kelly, became engaged. When her daughter announced her plans to marry a few years later, Comstock actually borrowed the wedding album and shipped it to New York, where her daughter was living. 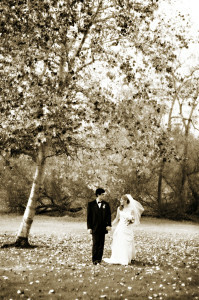 The wedding took place at the Comstock family’s vineyard outside Healdsburg. It was a small, intimate affair. Theilig was asked to tread lightly. Kelly and Chris Ferris at their wedding at the Comstock Vineyard outside Healdsburg in June of last year. One of the shots shows the bride’s shoes sitting on a rail overlooking the vineyard. There are no people in the shot. It looks almost like sculpture, yet somehow taps into the character of the day. Theilig takes an unusually artistic approach, such as this birds-eye view of a bride adjusting her garter at Verandas in Manhattan Beach. She also has a gift for directing people who are not models into occasionally posing in such a way that accentuates their own beauty and that of their surroundings. Nicole Zalazar was stunned when she opened the pages of her wedding album for the first time. Theilig also managed to convey the special connections between people at the wedding. Theilig captures the tender emotions of a wedding day, such as this exchange between the father of the bride and his daughter. Theilig said that she looks for little “vignettes” that collectively create a narrative for the day. When Zalazar looks at her album – which she admits is a very frequent pastime – something kind of magical tends to happen. It’s not as if she’s just flipping through pages so much as she is reliving the day. The connection that is formed between the photographer and her subjects tends to endure beyond that day. 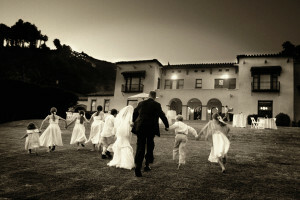 Genya and Jake Wittmann and their wedding party in the courtyard of the Shade Hotel in Manhattan Beach in 2008. Like any artist, Theilig is careful about her subject matter. When she meets with prospective clients, the interview goes both ways. If somebody calls and asks only about pricing and not what they want in terms of quality, then likely they are not a good match for what Theilig does. 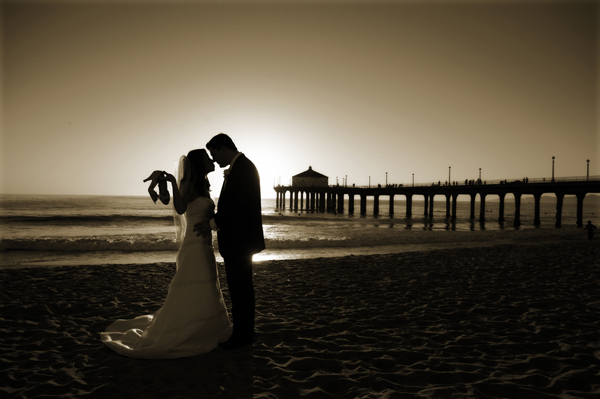 Amy and Dan Kutzkey at Manhattan Beach Pier prior to their wedding at the Shade Hotel. Unless we are celebrities, most days of our lives go by relatively undocumented. But this once, on this most special of days, things are different. 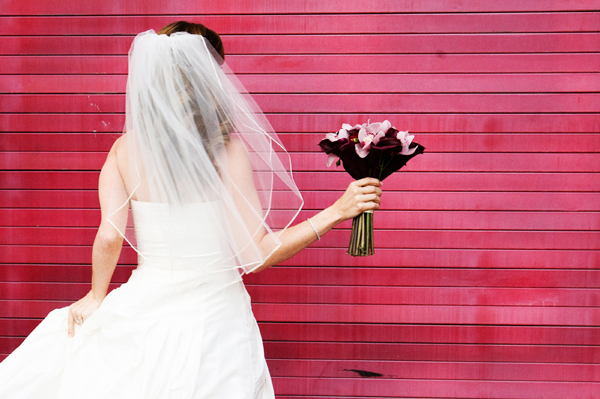 Most wedding photography, somewhat oddly, tends to be flatly unimaginative. Yet the subject lends itself perfectly to a more artful approach – a wedding day is among the most choreographed days of one’s life, when beauty is accentuated and strong emotions are allowed free reign. It’s the stuff of art. And Theilig is perfectly satisfied to call herself a wedding photographer. “When I think about my legacy, I may not be this famous fashion photographer or this famous landscape photographer,” she said. “But then I think about all the weddings I have shot and all the albums that have my name stamped into the corner…I’ve done maybe 300 weddings, so all those wedding albums are out there in the world, and people keep them forever and hand them down to their children. comments so far. Comments posted to EasyReaderNews.com may be reprinted in the Easy Reader print edition, which is published each Thursday. Discover how children can benefit from Kumon !! Daily News and Weekly Entertainment & Dining News delivered right to your inbox. We will never share your address. Our new LiveMarket Local Offers lets you promote your business to locals 24/7. Click below to get your 1st promotion going… no credit card required, no strings attached.